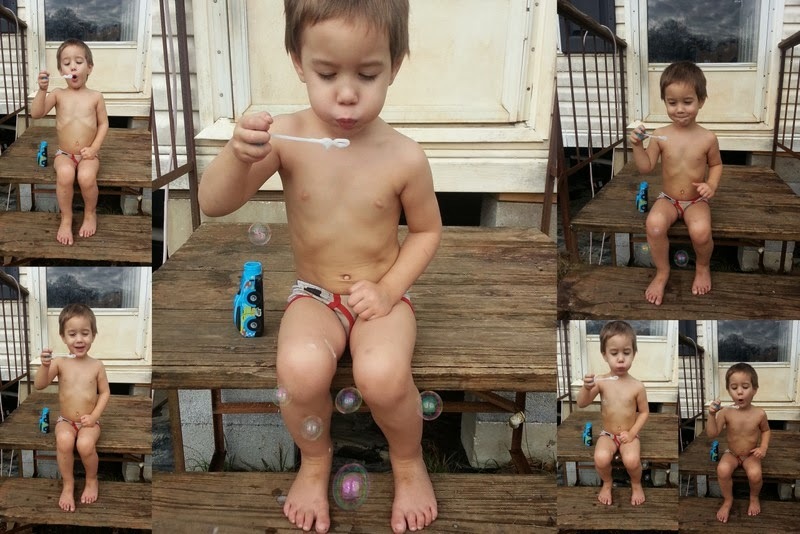 Last week, Miles begged me to go outside and blow bubbles. I finally gave in. (And yes, I realize that it is February and he is outside in his underwear but I can rarely get him to put on clothes and it was in the mid-60's that day.) We had spent the previous week stuck in the house due to rain, snow, and cold temperatures. This mom does not like being outside unless is it fairly warm. This kid sat here for over an hour blowing bubbles, taking turns handing me the blower thing, and also talking the the man who comes to read our meter. (Oh and waving at "Miss. Mail" when she came by.) I will be honest that this was far from what I wanted to be doing right then. I want to say that General Hospital was on but it may have been The Chew. I begged against his begging for him just to sit inside and color. I didn't want to take the time to go outside with him because I am not an outdoor person. I am glad that I did go out with him though because I learned all about "Miss. Mail" and "Mr. Three Notch", about his pet squirrel who lives in his house in the woods, about the monster who lives behind the house who is good, and about how when he was little with me, we used to go fishing in the pool in our front yard (a giant mud puddle right where I park normally). Taking the time out of my own wants to give this little guy an hour of bubbles was worth it. I know that I need to do that more often. And I am trying to be more intentional with things like that. It is still an adjustment with it just being the two of us at home and not going every time my mom calls and asks me to go. My house is a wreck and of course there is no excuse since it is just us all day. So we are working on this and getting a routine going. But I will gladly take the time to blow bubbles if it will make this little guy happy.